A newspaper article published by The Central Florida Press on June 20, 1930. The article describes a reception held in honor of Allen Thompson and his bride. 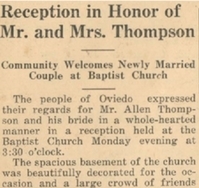 The reception was held at the First Baptist Church of Oviedo on June 16, 1930. The Thompson had migrated to Oviedo from Macon, Georgia, where they were married a week earlier. Original newspaper article: "Reception in Honor of Mr. and Mrs. Thompson: Community Welcomes Newly Married Couple at Baptist Church." The Central Florida Press, Vol. 1, No. 9, June 20, 1930, page 3: Oviedo Historical Society, Oviedo, Florida. Digital reproduction of original newspaper article: "Reception in Honor of Mr. and Mrs. Thompson: Community Welcomes Newly Married Couple at Baptist Church." The Central Florida Press, Vol. 1, No. 9, June 20, 1930, page 3. "The Central Florida Press, Vol. 1. No. 9, June 20, 1930." RICHES of Central Florida. https://richesmi.cah.ucf.edu/omeka2/items/show/5674. Originally published by The Central Florida Press. Copyright to this resource is held by The Central Florida Press and is provided here by RICHES of Central Florida for educational purposes only. "A Time to Keep: History of the First Methodist Church of Oviedo, Florida, 1873-1973." RICHES of Central Florida. https://richesmi.cah.ucf.edu/omeka2/items/show/5262. Alexander, Gross, James Brown Scouller, R. V. Foster, and Thomas Cary Johnson. A History of the Methodist Church, South: The United Presbyterian Church, The Cumberland Presbyterian Church and the Presbyterian Church, South, in the United States. New York: Christian Literature Co, 1894. “Reception in Honor of Mr. and Mrs. Thompson: Community Welcomes Newly Married Couple at Baptist Church.” RICHES of Central Florida accessed April 24, 2019, https://richesmi.cah.ucf.edu/omeka/items/show/5701.